some places (like whole foods) carry an "organic" food coloring paste set. i don't know if that's what you're looking for. i'll try to get the name of the product. otherwise, you could probably make your own for basic colors like green, red, etc. the old school way with spinach leaves and beets and things. Perchance, is your house overrun with cochineal beetles? Dancing Deer baking co. in Boston makes and sells natural food coloring. (or at least they sell it.) There's also an outfit called The Plant Group. Just today, I bought a pack of the Dancing Deer colors. 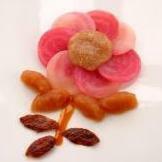 They are vegetable color extracts suspended in a sugar syrup. The colors in this pack are "rose madder red," from beets; "orange nasturtium," from turmeric and annato; "yellow light," from turmeric; "sage green," from spinach; and "blue violet," from blue carantho, whatever that is. They seem nice, and also a cut above the basic grocery store colors in that the blue and the red will clearly mix to make purple. (The commercial blue is unfortunately on the green side, and what you get when you mix it with red is usually more like grey than like purple.) I'm thinking of trying them out in meringues later this week, maybe. If I do, I'll report back on the experience. We're in the same boat - - -> looking for a natural food coloring. We have been talking to Dancing Deer and even made a road trip to their bakehouse in Boston to talk to them about buying it in bulk. We learned they make big batches periodically and haven't sold it in bulk. They're nice folk (or deer as they call themselves). They're gonna let us know when the make their next batch so maybe we can tag on an order. In the mean time we just ordered a different kind from Nature's Flavors. I'll report on the 2 oranges if they work. I have also recently emailed another natural foods company to see who makes their coloring for their products. Anybody else out there with companies they can get bulk natural food coloring would be great. When looking for stuff like this, I also tend to rely on business.com. Has anyone used the natural cocoa butter colors from Chef Rubber? How are they compared to their other colors. What about the natural ibc power flowers? Unfortunately they don't come in the full range of colors necessary (no yellow, no white) I have emailed them to ask if they are going to come out with yellow and white any time soon. I would love to be able to get something like their "discovery box" in an all natural version. In my digging a while back I stumbled on a major company that's based right here in St. Louis! Sensient. I haven't used them yet but I'm going to reach out shortly. They have a booth at PMCA every year - I've gotten some samples from them before - I believe that one of the folks from the workshop last year has bought from them - but quantites are large! Here we go - but not the person I recall talking about it. I was exploring us being able to visit during the workshop but all he could say is - how big is your company? He wasn't interested in a small group like us. Perhaps they would be willing to give us some samples for our workshop? I still have some of their interference powders. Trying to recall the name of my contact there - but I don't think she's front line anymore anyway. I'm just starting out and so I'm looking for really small quantities. I'm really trying to keep everything I do as natural/organic an I can. I'm gonna try some of the Chef Rubber natural colors and see how they work out. I'll post pictures when I have samples to show. @Beckykp27 have you considered a more classic aesthetic and not using any colors? You can still achieve beautiful chocolates with moulds, natural garnishes, using a contrasting chocolate for marbling/striping/accent, etc.. I know the siren call to airbrush and transfer sheet is strong but you don't have to go in that direction -- you could market on the beauty of natural & organic. I've thought about doing that but I'd like to incorporate colors. I'm also having a hard time getting my chocolates as shiny as I'd like, they usually have pretty bad release Mark's. I'm hoping colored cocoa butter will help. Beckykp27 hopefully you'll get a few more people answering your questions now that the Valentine's day production if over. 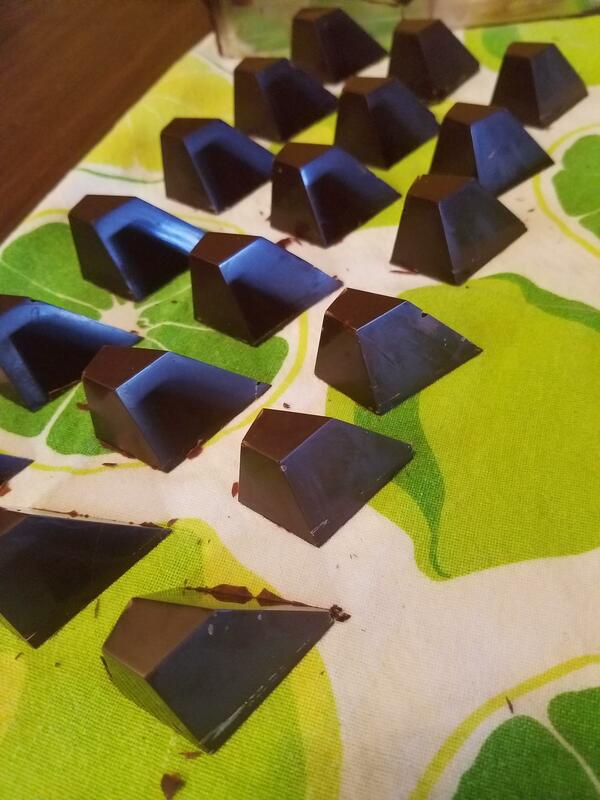 As far as not getting shiny chocolates... can you post some pictures of your work? What kind of moulds are you using? What chocolates are you using? How do you temper your chocolate? How are you planning to apply colored cocoa butter (manual application / airbrush)? A lot of questions but with more information, we can be offer better solutions. I temper primarily using the seeding method in the microwave. I am working in a home kitchen and do not have access to better equipment at this time. I do use a thermometer to ensure correct temperatures. I don't think my temper is the issue. Right now I am mostly working with Ghirardelli 63% as it is affordable and accessible for me. Welcome @Beckykp27. Looks like you did indeed pick some difficult molds to start with!. Large flat surfaces are always the most unforgiving and often show release marks. That's what I've read. Any tips on how to avoid or minimize them? Perfect temper, waiting until they are starting to thicken around the edges before popping them in the fridge for enough time to separate. The problems with that kind of molds are related to their edges. First of all those shapes tend to be an obstacle to air flow, which is needed for a correct crystalization (you need good air flow to lower the mold and chocolate temperature). I would suggest to put the molds on wire racks and not sheet pans, if you can use a fan to aid air flow then even better. Probably you'll need to put the molds in the refrigerator for some minutes (see Kerry's post). Second, those edges tend to create a gradient for latent heat of crystalization: chocolate will tend to crystalize more quickly along the mold edges (the local ratio mold_surface/chocolate_volume is much higher), this way there will be much more latent heat formed per unit of time, this can cause the chocolate to go over temperature and loose temper. So you need an effective way to dissipate that latent heat. 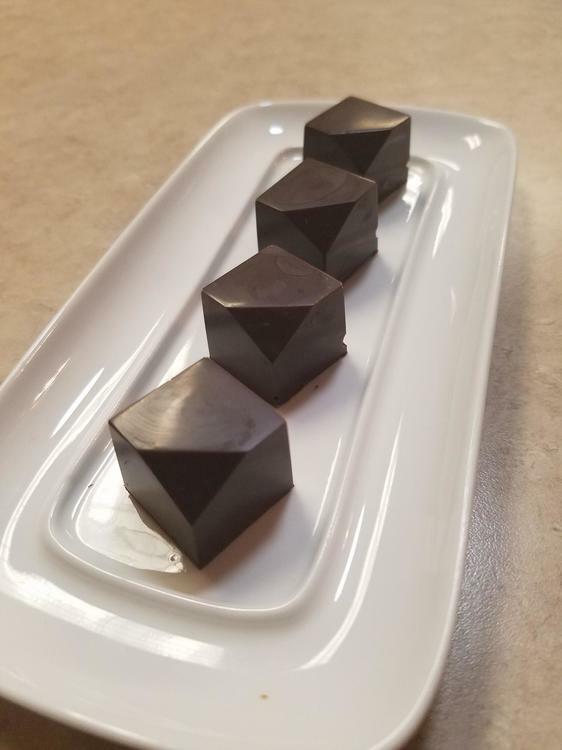 Third, the chocolate tends to crystalize more quickly along the edges (getting solid and shrinking) while it's still not crystalized on the rest of the surface, this will create some structural tensions inside the chocolate that can result in cracks. Some of those molds are almost impossible to get right without a cooling tunnel. I was thinking that a cooling tunnel (along with perfect temper) would be the answer but didn't want to look like a smart aleck for suggesting it. Especially since my reply wasn't going to be a through as teonzo's answer.